The Brown Sugar™ is inspired by one of the most sought-after tones for decades: the sound of a cranked vintage British non-master volume amp. Whether recorded on classic albums or played on tour by legendary hard rock bands, the raw power of plugging straight into a full stack and turning it all the way up has transformed blues and rock music forever. Guitar players have long tried exotic pickups and modifications to their amplifiers to achieve this special sound with different equipment and at more practical volumes. 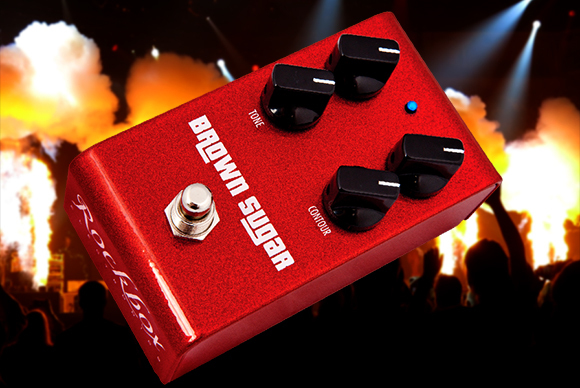 The Brown Sugar™ is designed to get close enough to those classic rhythm crunch and stinging lead sounds that you can feel it when you play, featuring four controls that interact together for organic, amp-like tones with sustain and presence. This is a truebypass pedal. The circuit is bypassed and the signal passes directly from input to output when the pedal is switched off.